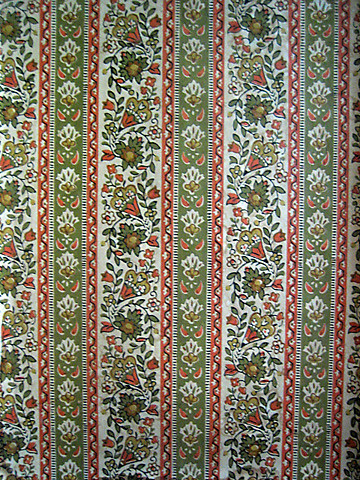 ugly wallpaper, originally uploaded by Tashabear. This is the ugly wallpaper in my back pantry. It Needs To Go. If it was in the whole kitchen I'd have painted over it long ago. Thank goodness it's just the back pantry, and not really visible from... well, anywhere but directly in front of the door to that space. That's some pretty impressive paper. Based on what was done to my hall bathroom before we moved in, paint over wallpaper has the potential to look icky fairly quickly, and it makes it very hard to remove later. Depending on the wallpaper, it might not be very hard to remove. We took 4 different kinds of wall coverings out of our house, with wildly varying levels of difficulty. I don't recommend the tool that scores the wallpaper all over so that the remover can soak in more easily, because it meant the paper came off in lots of little bits that needed individual attention rather than one big sheet. The Dif remover gel, however, was awesome. I'd check for a loose corner and see what's under there. If it's 2-layer (common if the top layer is foil, vinyl, fabric), you can usually just pull off the top later, then the under-layer is sort of like tissue that you can soak and if lucky pull, otherwise scrape away. If it's a single layer of paper-like stuff, then it's soak followed by pull or scrape. The most annoying thing we had was plastic stuff that was stuck on with a layer of glue that was 1 mm+ thick, I kid you not. The plastic came off so easily, but getting rid of all that glue was a nightmare. Oh no, this is definitely paper. 40-year-old paper. I second the "don't paint it" advice. In many cases, painting over wallpaper epoxies the wallpaper to the wall, and then when the wallpaper buckles, splits, etc, you might have to chip it off the wall with force. That's what I had to do on some of our walls here, painted over and wallpapered from one to several times. I had various wallpapers from hell all over this old house - the Dif stuff is stinky - the lady at the hardware store recommended Mr. Clean, and it worked extremely well - faster than Dif, and didn't smell as bad. The wallpaper is futt bugly, Tasha - I'm having flashbacks to the '70s. Yeah, but when your follow-on plan is "take out the whole wall, down to the stud" you don't so much care. We used the paper tiger in one room, but that was because the previous owners had papered, then painted, then papered again. Without the holes we never would have gotten any of it off. But I agree if it's just paper, no need for the paper tiger. We found the Dif worked pretty well, and even better if we applied it and soaked the paper pretty well, left it for a bit, then put on a second application of hot water and scraped. Somehow the double-soaking made for less effort in scraping. Every wall's different of course. Currently we have a room where the paper's so old and dry that we can work away at a loose corner and peel whole sections away without applying water, just peel and scrape. See, if that were fabric, I'd be all "That is awesome, can I have it?" Woah! That beats the wall paper in my bathroom! Wow - that's as bad as the duck border my old bedroom had. It had 6" high paired ducks, looking at each other, all around my room. I drew an executioners hood on one, and gave him an axe, then a blindfold and cig to the next; just on one pair, but it made it more tolerable until I could strip it off. Those are awesome, but I'd get a guilt complex if I ate the scare little guy! I... kinda like it. I don't think I'd want it on my walls, but I... uh... yeah. I think it's the burnt orange and avocado colorway that makes it horrid. Plus, it's so dark that it makes the already small space look really tiny. And brighter than the stuff we had in Holyoke. Two of the rooms the paper had a solid medium blue background, with patterns of lighter and darker blues, black and silver on one and the other was shades of blue that looked like a photograph of an afghan -- no, really. The third dark room had a medium green background with gigantic acanthus leaves in green w/gold and black outlining/highlights. No white at all. Luckily that's just the back pantry -- this little addition off the kitchen that just has that slop sink and some cabinets. It does make the small space look smaller, and it's so dark and discolored from age that it makes it look wicked shabby. It's very much like what my mom put up in our kitchen when we first moved into that house, in 1972 or '73. It's just busier. And time has made it darker, which is worse. When I first saw it I thought it was brocade fabric for an elizabethan and I thought ooooh.